Any data-intensive organization needs UPS systems to always be operational. In the past – or in cases where legacy systems are still in place – everything grinds to a halt because of a component failure. However, implementing N+1 redundancy ensures that nothing will be disrupted. Work can go on and goals can be met. Also referred to as a parallel redundancy, N+1 is used as a safety measure that guarantees that an uninterruptible power supply (UPS) remains available at all times. The N refers to the number of UPS modules needed, while the 1 specifies one more. An organization that deals with large amounts of data on a daily basis requires that the data be available at all times. Usually, a UPS system is installed to ensure that operations continue in the event of a power outage or some other kind of power failure. Installing only one large UPS may result in all systems being disrupted in the event of a UPS failure. By using an N+1 scheme which configures the connection of several UPS modules the load is shared so in the event of a single unit failure, the system can still provide the needed power supply. Given what it’s supposed to provide, it’s clear that an N+1 scheme is best suited for facilities that need systems to be running at all times. For example, a data center greatly benefits from an N+1 UPS setup to ensure that all systems remain functioning despite failure at a single point. Other than data centers, any organization that requires reliability will stand to benefit from implementing an N+1 UPS scheme. Redundant systems like the N+1 are also commonly implemented in the aerospace industry where such a setup helps ensure the safety and integrity of spacecraft. There’s more to consider than just simply getting N UPS systems and an additional one for a facility. For example, a data center using a legacy system can implement an N+1 scheme with the help of static transfer switches (STS), which control the power source responsible for providing power to servers and IT equipment. An STS can be put between UPS’s so that a switch occurs when one fails. The kind of equipment used should also be assessed as to its system efficiency. For example, a blade server requiring high power density means that an equally powerful UPS is needed for the said server. One has to remember in implementing an N+1 redundancy system that the UPS is only 50% efficient. 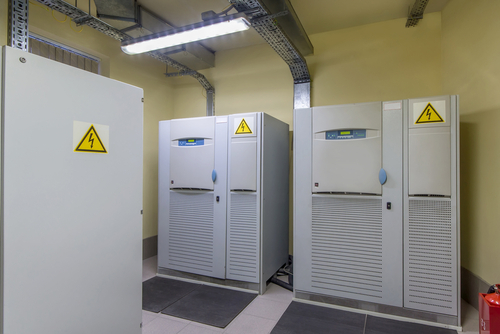 Cost and electricity consumption have to be considered when designing an N+1 UPS scheme so features such as advanced battery management might be included in the system. Facilities and organizations that require systems to be up at all times, even in the occasion of failure, benefits from an N+1 UPS setup. That said, certain considerations need to be made to ensure that the design results in system efficiency. Staco Energy provides all types of UPS systems and can configure N+1 UPS for any specific requirement. Need further information please contact Peninsula Technical Sales (pentech.com) at 650-965-3636 or e-mail us at sales@pentech.com.